Are you having a fabulous Labor Day holiday? It sort of signals the end of summer and the coming of fall, doesn’t it? That includes time for Fall Food and Treats. I came across these delicious little Fall Treat Bites on Reasons To Skip The Housework. 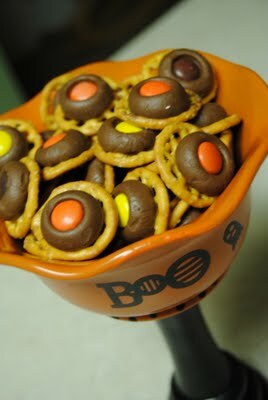 Chocolate, pretzels and Reese’s Pieces all in one yummy bite. Click HERE to check out the easy “how to” and make these yummies for yourself. What a great salty-sweet combination. Yum! You can find more Reasons To Skip the Housework on Facebook, Twitter, Instagram, Pinterest and Google Plus.